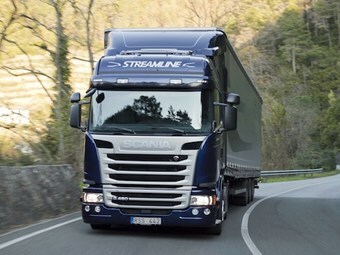 The new streamlined Scania cab is hoped to improve fuel consumption, and thus save money at the pump. Scania has relaunched the Streamline long-haul truck concept for G- and R-series cabs. The move to resurrect the badge first introduced in 1991 reflects a new aerodynamic treatment of the cab and mechanical improvements aimed at saving fuel that echo the earlier effort, Scania Australia Managing Director Roger McCarthy told a media event in Melbourne today. "This will be the most significant step-change Scania will make for the foreseeable future," McCarthy says. Global production is slated to start in July, when orders can be taken, with the first vehicles projected to arrive in September or October. Improvements include low-drag gearboxes with friction-optimised internals, a lighter and stronger single-drive rear axle, and a revised and enhanced Scania Opticruise automated gearchange system with three modes designed to make the most of the low-rev, high-torque engines. A new dual battery set-up, two absorbed glass mat-types for engine starting and two gel-types for auxiliary functions, is aimed at a major cause of breakdown call-outs - flat batteries. Though expected fuel savings capable of being made under European conditions are put at up to 8 percent in Euro 6 configuration, McCarthy says Australian conditions mean 3-4 percent "should be achievable". Either way, driver training and coaching must be embraced to help realise the savings. In Europe, Scania is presenting the Streamline cabs with a second generation of Euro 6 engines, including new 450 hp and 490 hp 6-cylinder options, which will be available in Australia in due course. The new 520 hp and 580 hp V8 Euro 6 engines will also be available locally in the medium term, these engines adopting the new generation architecture that debuted in the 730 hp Euro 5 engine two years ago. "The new Scania Streamline is the latest evolution of the Scania cab that has been continually improving since the debut of the R-series in 2004, and the update in Europe in 2009 that won International Truck of the Year," McCarthy says. "With the new Streamline models in G-series and R-series, we are presenting meaningful aerodynamic enhancements to the cab, as well as meaningful mechanical and technical upgrades that help to reduce running costs for our customers, boosting their profitability. "The adoption of the friction-reduced low drag gearbox, revised and more intelligent Scania Opticruise gearchanging software, new rear axle, freshened and improved interior appointments and comfortable driver and passenger seats, that include optional ventilation, provide both operators and drivers with a higher degree of comfort owning and running a Scania." Meanwhile, Scania now has two production units of its limited edition Black Amber R-series V8 prime mover in the country - and R 730 that will appear at the Brisbane Truck Show and an R 620.